Halemaumau crater at Kilauea volcano. Is Hawaii part of the Ring of Fire? Could the ongoing eruption at Kilauea volcano trigger similar outbursts along the West Coast, or explode like Krakatoa? If it weren’t for volcanoes, would the Earth itself explode? The answer to each of these questions is a resounding “no.” And yet all of them were recently promoted by high-profile news outlets or respected individuals with large social media followings. And that’s not even the worst of it. In more conspiratorially-minded corners of the internet, folks have been wondering whether shockwaves from North Korean nuclear tests rippled through the Pacific tectonic plate, triggering Kilauea’s eruption. Or perhaps it’s all just ancient aliens messing with us. Every major scientific event, from a solar eclipse to an iceberg calving in Antarctica, spawns its share of sensational media coverage, false claims, and conspiracy theories. But for whatever reason, volcanic eruptions seem especially prone to getting swept up in hyperbole. And that’s unfortunate, because while chemtrails aren’t going to kill you, getting the wrong information on an eruption just might. That’s why official sources like the U.S. Geological Survey (USGS) and a cadre of scientists have been working overtime to disseminate accurate information and debunk myths as the eruption at Kilauea continues. And they’ve seen some success. 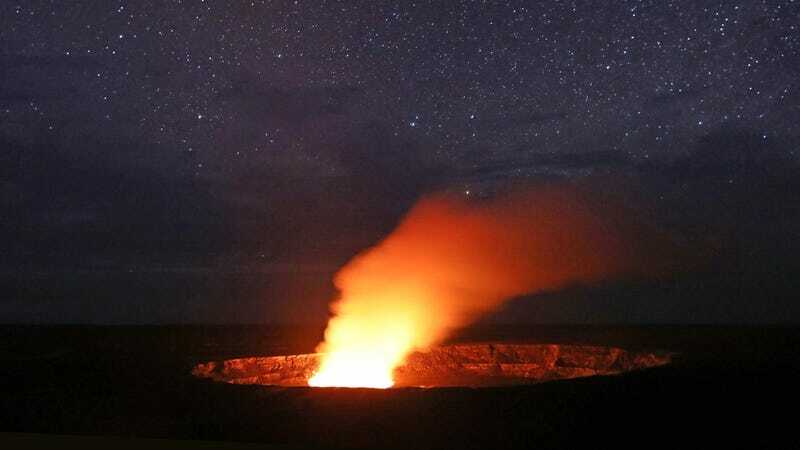 In an article published on May 13, the Associated Press spread the idea that Kilauea is part of the geologically-dubious Ring of Fire (it’s actually a hotspot volcano in the middle of the Pacific plate), and that its eruption might trigger heightened volcanic activity on the West Coast (the two systems are unconnected). Scientists were quick to respond on social media, prompting the AP to delete a tweet and slap a correction at the top of its story. Then there’s the notion that Kilauea “could be another Krakatoa,” a reference to the Indonesian volcano’s massive 1883 eruption that killed over 36,000 people. Laurence Tribe, a Harvard constitutional law professor, tweeted this nonsensical scenario to his 334,000 followers on Sunday. According to Michael Poland, a volcanologist with the USGS Yellowstone Volcano Observatory, the size of Tribe’s audience prompted USGS Volcanoes to issue a rare direct rebuttal on Twitter. Tribe subsequently deleted the tweet. Poland is one of several scientists that USGS has called in to help field social media questions and disseminate information while staff in Hawaii focus on the local response. He told Earther the flood of queries regarding Kilauea’s activity has been “incredible.” While the social media team tries to respond individually as much as possible, sometimes, when a false rumor pops up over and over again, they issue a more official response. That happened on Monday, when the USGS Hawaii Volcano Observatory published an article explaining that no, Kilauea is not going to fall into the ocean and generate a Pacific-wide tsunami. The wild-sounding idea stemmed a respected source: A May 7 article published by UC Berkeley’s Seismology Lab, which discussed a low-probability scenario in which the collapse of Kilauea’s south flank generates a giant undersea earthquake. Emphasizing the likelihood of a specific scenario is a hallmark of good disaster communication, according to Concord University volcanologist Janine Krippner. There’s also the concern misinformation will erode trust in real information, causing people to, say, not take evacuation orders seriously when their lives are at risk. Poland said he was especially disturbed by the rumors of Kilauea sliding into the sea because of how much it upset locals. Compounding the difficulty for scientists is the fact that the outlets doing the most damage—several volcanologists I spoke with cited “the UK tabloids” as the worst offenders—have outsized platforms compared with the folks trying to clear the air. Another problem is that most of the lay public learns next to nothing about volcanoes in school. By and large, “colloquial knowledge” is the stuff we pick up from disaster flicks: think 2003's The Core or the 1997 classic Volcano. Fun as they may be, movies like these have ultimately reinforced a smorgasbord of false beliefs, from the idea that every eruption will be a global event (there are often more than a dozen happening around the world at once), to the notion that eruptions are only dangerous if they’re spewing fountains of lava (giant ash clouds can be just as bad), or that maybe you can just outrun a pyroclastic flow (you can’t). Asked how the media can help combat these ideas, Klemetti said it’s important to make sure information is from good sources like the USGS, and to cool the discussion of worst-case scenarios. Ultimately it’s important to remember that eruptions are natural, normal events, and that just because you’re hearing about one in the news right now doesn’t mean the Earth is entering some sort of state of heightened activity or unrest (yet another very common misconception). But as long as volcanologists have to fight our psychological programming, they will. After all, lives are at stake. Geophysicist and disaster researcher Mika McKinnon emphasized how important it is that every expert with a platform step up when they see bad information making the rounds.